The flu outbreak, are you in? In spring, the most pleasant thing is to walk in flowers and enjoy the Piano Songbirds with our beloved. In summer, the most comfortable thing is to feel the cool after sweating and to eat a popsicle. In autumn, the most satisfied thing is to see the fruit hanging heavy on the trees. In winter, the most carefree thing is to chat and knock around together with our friends and family around the hot pot. The winter of 2017 seems to no longer give people the opportunity to enjoy the chaffy dish, a menacing flu hit us. However, if you think the flu is only in China, you are ignorance. Currently, the northern hemisphere enters the stage of high incidence of influenza and the influenza A (H3N2) virus in the United States and Canada rages. But China is mainly Influenza B, and the number of Influenza A cases in Europe exceeds that of Type B. Recently, the U.S. Centers for Disease Control and Prevention said that there has been a sharp increase in influenza activity in the United States by the end of 2017. From December 24 to December 30, a total of 9228 influenza positive samples were identified by the U.S. clinical laboratories, of which Influenza A and B accounted for 84.6% and 13.3% respectively. Tan Yong-shi, the chief of public health officer of the Canadian Department of Public Health, said: "The influenza virus is at an active peak in Canada." The majority of cases in the country are type of A (H3N2) and the number of Influenza B cases continues to increase. As of the end of last year, a total of 1050 people in Canada were admitted to hospital for "flu-related" reasons, leaving 34 people dead. National Health and Family Planning Commission of the People‘s Republic of China has released a new version of flu diagnosis and treatment scheme. Antiviral treatment works best for all patients who have been attacked by influenza for no more than 48 hours. Oseltamivir (Tamiflu) and Zanamivir, palmer peramivir and Lianhua Qingwen Capsules are included in the recommended drugs. For the "hot poison attacking lung" patients, the recommended drugs are Lianhua Qingwen Capsules, Silver yellow agents and lotus heat agents etc. Children's optional is Xiao'er Feire Kechuan Keli (oral liquid), Xiao'er Kechuan Keli (oral liquid) and antelope horn powder administered after dissolved. How much do you know about influenza? Influenza virus is the representative species of Orthomyxoviridae. It is called Flu for short, which can cause acute upper respiratory infection. It spreads through the air and it is always cyclically pandemic all over the world. It includes human flu virus and animal influenza virus. Human flu virus can be divided into A (A), B (B), C (C) 3 types. 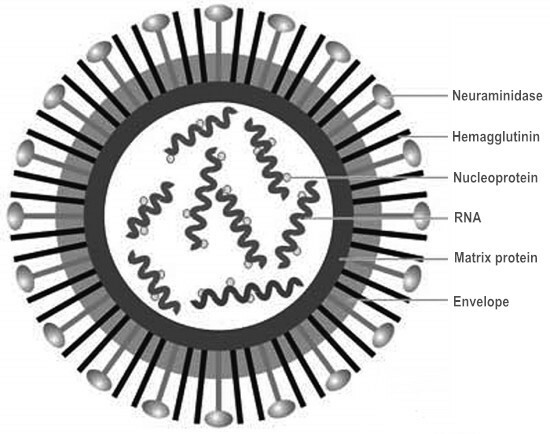 It is the causative agent of influenza (flu), whose basic structure can be divided into envelope, matrix proteins and three core parts (as illustrated in following picture).On the basis of antigenicity and variation in different ways, it can be divided into many kinds of subtypes. influenza A, B and C virus is just specific to human influenza viruses, usually people don't call bird flu virus and other flu virus of non-human host as influenza A virus. Influenza A virus subtype is known as "Bird Flu". Avian influenza (Bird Flu) is an acute infectious disease caused by avian influenza virus. The virus gene can infect humans after mutation. The infection source of influenza virus is mainly the patients, and the recessively infected human comes the second. The infected animal is also a kind of infection source. Droplet with influenza virus enters the body through the respiratory tract and comes to be the main transmission route of influenza virus. Sometimes it can infect human through indirect contact by common handkerchiefs, towels, etc. Most of human are susceptible and the incubation period depends on the amount of invading virus invasion and immune state of the body. It is usually 1~4 days. The patient will suffer chills, headache, fever, aches, fatigue, nasal congestion, runny nose, sore throat and cough and other symptoms. It is not difficult to diagnose the flu according to clinical symptoms during the epidemic period, but a definite diagnosis or monitoring requires lab checking and screening, mainly including virus isolation and culture (hemagglutination test), serological diagnosis (hemagglutination inhibition test or complement fixation test) and rapid diagnosis (ELISA, direct or indirect immunofluorescence, PCR method, etc.). Influenza vaccination is still the most effective way of prevention against the flu. However, influenza virus often mutates, thus drug selection is still a difficulty on the use of the vaccine. Besides influenza viruses , other seasonal diseases, such as allergic disease, foot and mouth disease, rubella, mumps, encephalitis, tuberculosis, diarrhea, are always bothering people. In daily life we must work out frequently to enhance our immunity of the body, alternate work and rest, have healthy diet and pay more attention to hygiene so as to keep us away from disease. We are serious and concerned about your health and we are professional on kits for research use. The following list is just part of our elisa kits,proteins and antibodies. Please log on our official website for more information. Here is the list of our Elisa kits. Here is the list of our Proteins. Here is the list of our Antibodies.